*If you want your creepypasta or general horror/paranormal related website or YouTube channel listed here, reply to this post with a comment leaving your site’s URL and name. *Note that all links are vetted by me personally first, so please don’t ask me to link something completely unrelated to our genre. Anything that veers into shock site/overly gory/etc territory won’t be linked simply because I don’t want to be associated with that type of content. *I will clear out dead links every few months. If your site has moved without redirect, you’ll need to let me know the updated address in order to avoid deletion. Inactive sites will be allowed to remain as long as they still have their archived content available and aren’t compromised by malware/hackers. 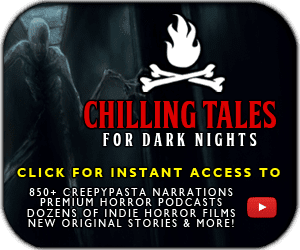 *For the “frequest creepypasta contributers” section – if you’ve had at least TWO stories approved for the main site and have a writing blog that you’d like to have linked here, leave a comment with a link to your site, the pen name that you go by, and the pastas that you’ve written. *We have removed MrCreepypasta from our listing due to receiving complaints from authors that he changes and then reads/reposts their work against their wishes. Please do not suggest that we re-add him. Remember, guys, just because it’s posted online doesn’t mean that the author has given up their copyright. Please be careful and remember that the authors do have rights, and that without these authors, sites like this one or channels like MrCreepypasta’s would NOT EXIST.